HTC EVO 3D stops bullet and saves a mans life! 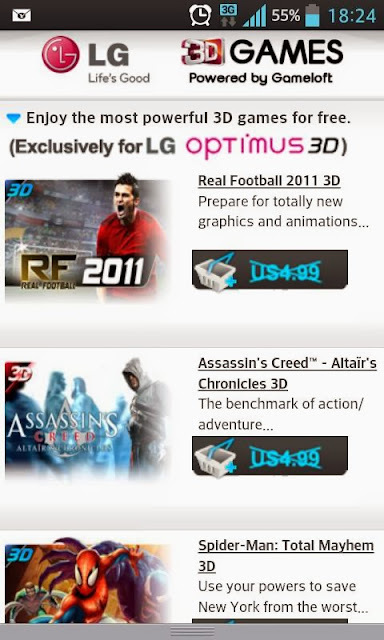 Free 3D Gameloft games for the LG P920 Optimus 3D! I just acquired this LG P920 Optimus 3D glasses free 3D screened phone already knowing it comes bundled with three 3D optimised games from Gameloft: N.O.V.A. , Let's Golf 2 and Asphalt 6. Suggest you do so via WiFi and that you have plenty of storage space cleared for the games. The EVO 3D I have came bundled with three 3D games, Spiderman 3D, The Sims 3D and Need for Speed 3D and that's all so far as I am aware. Some countries also got the Green Hornet 3D movie bundled (mine didn't). Let me know if there are any other EVO 3D specific freebies I should be aware of. Till then I think LG beats HTC on the sheer number of free 3D games on offer! I am looking to buy all the remaining Gameloft 3D enhanced titles to complete my 3D game collection. Avatar and N.O.V.A.2 look especially attractive. Only a bargain basement 10HKD a piece. Very pleased with this Optimus 3D regards these freebies.